Thiruparankunram temple, one of the six abodes of Lord Muruga, draws the attention in many aspects. The huge temple carved out of the rock, presiding deity in the sanctum carved in rock, shrines of Lord Shiva and Lord Vishnu facing each other, sculptures of peacock, mouse and bull by the side of the flag post are the interesting aspects of this temple. Lord Muruga in this temple is worshipped in the name Parangirinathar and the mountain where the temple is located is called as Thiruparankunram. Lord Muruga is seen with his consort Deivayanai, daughter of the celestial God Indra. The curious features of this temple makes this more special witnessing thousands of devotees round the year. Besides the other factors, the anointing for the presiding deity is done only for the lance standing by the side of the rock-carved statue of Lord Muruga. The temple is believed to be in existence since the Sangam era and finds mentioned in several places in the Sangam literatures. Lord Muruga is worshipped almost by all Tamil families and this temple is of high significance in the southern region of Tamil Nadu. 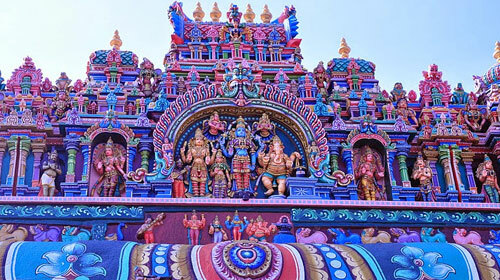 In Thiruparankunram temple, more than twenty five festivals are celebrated in a year. Out of these, Panguni Uthiram, Vaikasi Visagam, Thai Poosam besides the monthly Sashti festivals. As the temple houses the shrines for Lord Shiva and Lord Vishnu, the concerned festivals are also celebrated in a grand manner. Devotees worshipping Lord Muruga as their family deity make it a custom that the tonsuring and ear boring ceremonies are carried out for their children at this temple premises. Almost round the year, such a customary rituals are carried out in this temple making it one of the most popular temple thronged by the devotees and tourists throughout the year. Come and get blessed by Lord Parangirinathar at this Holy Hill !